Robotic Muffin Depanning White Paper by Precision Automated Technology. Precision Automated Technology has produced a Muffin Depanning white paper. Below you’ll find all of the valuable information. You can also download the white paper here. Baking automation is a cutting edge way to increase product quality while increasing revenue. The integration of robotic automation is specifically usefully for muffin depanning. Each baked muffin can be depanned (picked) and placed simultaneously onto adjacent packaging conveyors. 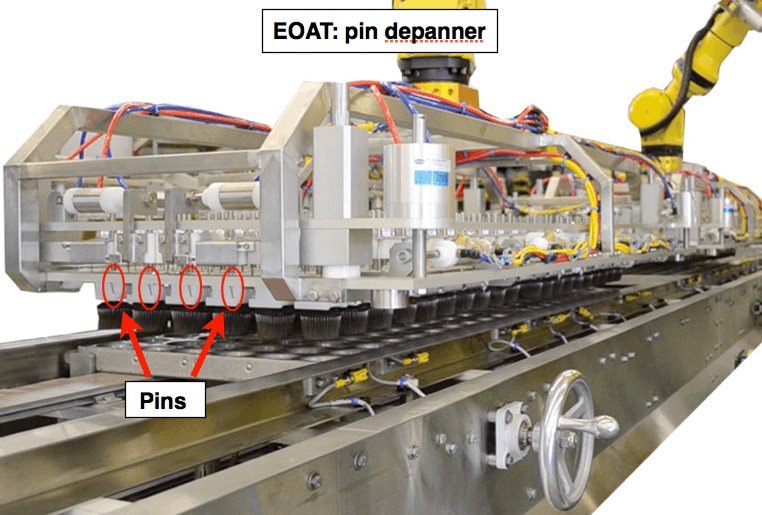 Specialized end of arm tooling (EOAT) attached to the robot’s arm can also rearrange the position of the depanned muffins into the specific count and position needed for the packaging containers. EOAT can be custom made to fit exact project requirement. Precision Automated Technology has developed robotic muffin depanning systems that depan muffins at rate of 1,200 muffins per minute. While each robotic muffin depanning system that Precision Automated Technology builds is customized to fit exact project requirements, each system also shares many similar features which are outlined below. Integrating a robot(s) into an automated muffin depanning system is the first step towards increased product quality and revenue. The robot stand as a foundation from which each additional feature is built upon. Here is a list of some of the robots that Precision Automated Technology uses while designing and producing automated muffin depanning systems. While the robot can be thought of the powerhouse that does all the heavy lifting, the EOAT, can be thought of the fingers attached to an arm. The EOAT is what physically interacts with the muffins. It’s the EOAT that manipulates the muffins once they are depanned. Muffins can be rearranged and sorted into the proper packaging order due to the the tooling’s ability to move and slide. An important feature of robotic muffin depanning systems is the ability to quickly change the EOAT to accommodate for different shaped and sized muffins. The same conveyor line is often used for multiple baked muffins as a way to save factory floor space. The robotic muffin depanning systems produced by Precision Automated Technology come equipped with Quick Change Tooling. 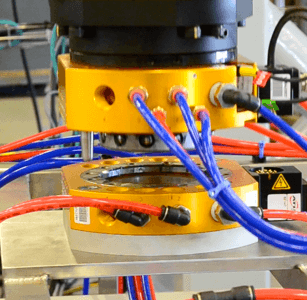 The entire EOAT on the robot can be changed quickly without the use of any tools or the need of a human technician to physically handle the tooling head. A pneumatic connection ring acts as a quick release and attachment point. EOAT changes can take place in a matter of seconds, not minutes. This Quick Change Tooling feature results in less downtime which equals increased efficiency and revenue. Whether you’re just beginning your journey into robotic muffin depanning systems, or ready to partner with a robotic integrator, Precision Automated Technology is your solution provider. We have over 20 years experience in bakery automation. Our robotic muffin depanning systems have been installed worldwide. Watch our Robotic Muffin Depanner in action. Precision Automated Technology, Inc., has been transforming complex and labor-intensive production tasks and processes into smoothly operating automated systems. 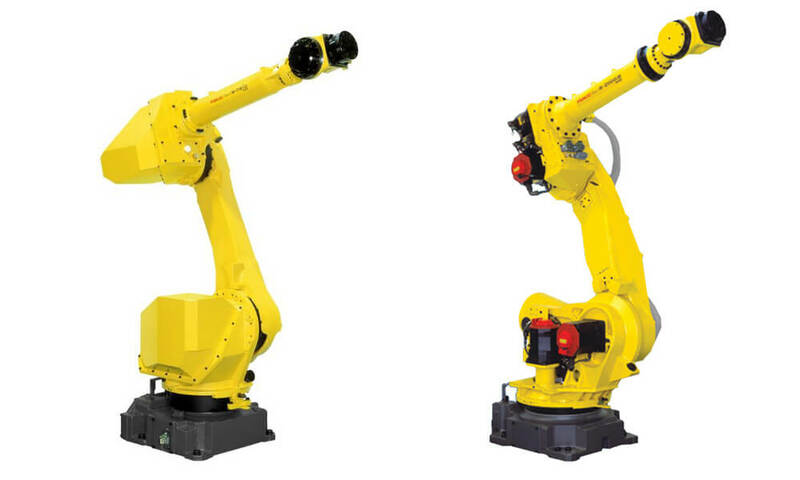 We excel at providing robotic solutions to fill the gap where off the shelf solutions do not exist.